It’s Fathers Day and a little birdie mentioned that all golfers love to “par-tee”, especially after the 18th hole. For all the dads who love the game, celebrate his special day with a “par-fectly” planned lunch. The event begins with a “full course” menu. 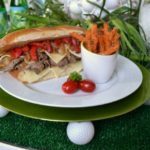 The man-sized menu includes a hearty beef and cheese “club” sandwich smothered with caramelized onions and served with an au jus sauce for dipping and side of Seasoned sweet potato fries. The dessert,Putter Nutter Par-Faits are served in tall skinny parfait glasses. Scoops of home-made salted caramel ice cream layered with chocolate and caramel sauce topped with fresh whipped cream. Added to this delicious dessert as a garnish is crumbled Nutter Butter® peanut butter cookies, coarse sea salt and one mini round Nutter Butter Cookie. To keep everyone in the swing of things serve your favorite iced tea, perhaps an Arnold Palmer (half tea/half lemonade), Dr. Enuf, an upper East Tennessee made soda and or coffee. Upon arrival, your fairway friends will applaud the pristine course tabletop. Faux Astro turf lines the tables as the putting green. A turquoise, lime green, navy and white table runner lines the center of the table and was the color inspiration for this luncheon. The centerpiece is a large glass urn filled with new golf balls and tees surrounded by potted liriope grass as a reminder that there are “hazards” in this game. Standing in the midst of the balls and tees are pennant flags made from card stock and golf inspired stickers proudly boasting accolades and Number One Dad. Monochromatic argyle designed scrapbook papers were fashioned as beverage wraps for glass bottles while plastic stir sticks sport a practice ball on one end of the stick. The dinner is served on the classic white dinner plate while practice balls are attached to the base of green chargers. At each place setting light blue cloth napkins are rolled tight and placed in a “Tee” crafted napkin ring. The rings are made of card board paper tubes cut to Tee- length size, glued in opposite directions and spray painted glossy white. You don’t have to know how to play the game of golf to host a great par-tee for dad but it might be a good idea to brush up on a few golfing terms to be in the know. Here are a few accurate terms that were used in a pun-way in this article. A birdie is a hole played in one stroke under par. A par is a standard score for a hole (defined by its length) and a tee is a wooden peg used to hold the ball up for driving, it is also the term used for the area where the play begins on a particular hole, like the third tee is where the third hole starts. For those who are not familiar with the game of golf, here is a complete guide to common golf terms. A person could get tee’d off just learning all the terms but this particular term is a familiar one, at least when I have played the game. My personal favorite is fore, a warning shout given when there is a chance that the ball may hit other players or spectators; hopefully that term will not be heard during this Father’s Day lunch event. Chocolate and caramel sauce, whipped cream, ½ cup cookie crumbs, coarse sea salt. In medium bowl, place first six ingredients. Pour mixture into freezer container of ice cream maker and follow instructions. (Instructions and time may vary). Store in freezer in an airtight container until ready to serve. 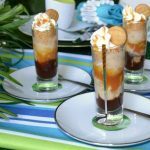 For a pretty presentation serve these parfaits in tall glass Tom Collins or ice tea beverage. Garnish with miniature toy golf club or scrapbooking three dimensional stickers. Salted Caramel Ice Cream with Peanut Butter cookies is the content of this dessert. Putter Nutter was added because I used Peanut Butter Nutter Bars in the recipe and added a scrap-booking miniature golf club to the side of the glass parfait. If you don’t want to make home made ice cream, purchase your dad’s favorite flavor and layer in parfait glasses. In large saucepan, sauté onions in butter until softened, add sugar to caramelize. When golden brown, remove from pan and set aside. In same pan, heat beef slices until warm. Add beef broth to moisten. Split rolls and toast under broiler until light brown. On both sides of roll spread thin layer of mustard. Place cheese slice on bottom roll, layer the beef, top with onions and red pepper slices. Top with roll. 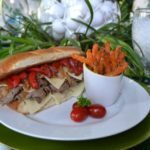 Serve it up Sassy with individual Au Jus sauce per sandwich. In small skillet or saucepan, caramelize the onions in olive oil. Deglaze the pan with vinegar, then add Worcestershire sauce, stir constantly. Add beef broth and bring to a light boil. Reduce heat and simmer for 30 minutes. Strain broth and then return to pan. In small custard cup with 2 tablespoons cold water, add teaspoon flour, stir to dissolve. Simmer additional 5 minutes until slightly thickened. Preheat oven to 450 degrees. Line baking sheet with parchment paper. Lightly spray paper with cooking spray. Place sweet potato slices in large plastic sealed bag, add olive oil to bag and toss slices. In a small bowl, mix breadcrumbs, cheese and seasoning. Pour seasoning onto potato slices and toss to coat. Place coated fries onto baking sheet. Bake 15 minutes, turn fries, Bake 10 minutes or until fries are done. Serve it up Sassy with grated cheese and fresh rosemary on serving plate or platter. * In a hurry, use frozen Sweet Potato Fries as a substitute. Liz Bushong is an expert in the three-dimensional art of entertaining. She transforms simple dining occasions into beautiful and memorable moments by adding a touch of her own “sassy” style. For the past several years Liz been entrusted to decorate the White House for several Holidays and special events. She is a featured monthly guest designer-chef on Daytime Tri-Cities, Daytime Blue Ridge and other television shows. Liz is the author of the Just Desserts and Sweets & Savories cookbook as well as a contributing writer for VIP SEEN Magazine.